Serviced offices in the cultural and economic heart of Gent, this centre provides a great working environment for clients to concentrate on their core business. The offices are fully furnished and suitable for a single person business as well as larger businesses. The flexible use of services and facilities include a team of highly experienced staff, co-working possibilities and various meeting rooms. Apart from being conveniently located close to the Fr. Roosevelt Lane and the E17 motorway this business centre is in walking distance from cafés, restaurants and one of Gents major shopping centres. Well located, in a popular business park near Gent, this brand new business centre offers office space with high quality facilities also including secure bicycle parking and showers. 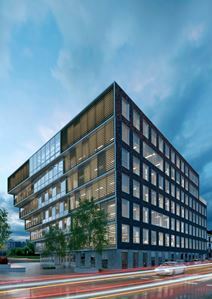 It is close to the E17 motorway intersection with a direct connection to Brussels Airport and public transportation links. There is also IT support provided for the shared internet on-site so that you stay well connected at all times. Opening in mid June of 2019, this modern and brand new business centre offers a fantastic range of office solutions, ideal for professionals, creatives and entrepreneurs. The centre offers flexible rates and affordable terms, with an all-inclusive fee to make things simple for you. With 24 hour access to the building you can work around the clock and at your own pace. The location is convenient and central, with all the amenities you need right on your doorstep. This centre is located at the junction of two important motorways, and is easily accessible by private and public transportation. The centre offers fully serviced office space, suitable for a range of business sizes. A full selection of business support services is available to clients. Within the immediate vicinity, you can find an abundance of shops to enjoy and explore outside of work. There is also a selection of cafes in which you can entertain and impress clients. Situated next to Dampoort Station this new building provides fully furnished office spaces with cutting edge facilities to help forward-thinking companies flourish. There are ergonomic chairs for comfort, plenty of parking and bike storage while the building itself is BREEAM excellent rated. In addition, you can benefit from 24 hour access and an abundance of public transport links within the area. This is the ideal centre for businesses that value convenience, accessibility- all at at an impressive space. Located in a 19th century mansion with a spacious city garden in the heart of Ghent, this beautiful co-working space with period features combines the old with the new in the form of modern workspace with high-quality technology. Great links to public transport close by, making commutes as simple as possible.